Floods and blackouts caused by Tropical Storm Pabuk left nearly 30,000 people in evacuation shelters across southern Thailand Saturday, as relieved tourists stranded on islands further north were spared the worst and began to plot routes home. Pabuk, a once in three-decade weather system, packed winds of up to 75 kilometres (45 miles) an hour and brought heavy rains and storm surges as it lashed the entire south of the kingdom on Friday, downing power cables and causing widespread flooding. A fisherman died in southern Pattani province early Friday after high waves smashed into his boat and another crew member was reported missing, while a 35-year-old man in Nakhon Si Thammarat died when a tree toppled onto his house. But the storm tacked away from the key tourist islands of Koh Samui, Koh Phangan and Koh Tao where large numbers of travellers hunkered down for 24 hours in heavy rains, unable to leave as airports closed and ferry services were cancelled. “There were no casualties, there is some sunshine today and I’m confident some tourists will be able to leave today as ferries and flights resume,” said Koh Samui district chief Kittipop Roddon. But “red flag” swimming bans off what are normally sun-baked paradise beaches at this time of year were still in place. “It’s all over. All 10,000 tourists are safe… I am relieved,” said Krikkrai Songthanee, district chief of neighbouring Koh Phangan, an island famed for its full-moon parties. High winds caused only minor damage, he added. But holidaymakers keen to leave the islands face long delays with a backlog of flights as three airports reopened and ferry services slowly resumed on Saturday. 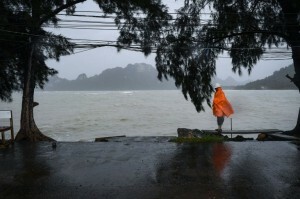 The storm was downgraded early Saturday to a depression with wind speeds slackening as it moved into the Andaman Sea, Thailand’s weather bureau said. Pabuk made landfall on Friday afternoon in Nakhon Si Thammarat province, south of the tourist hubs on the Gulf of Thailand, hammering the coastal province with rain. Authorities warned of flash floods as some parts remained inundated by a combination of rainfall and storm surges. Around 200,000 people were left without electricity as dozens of power poles were toppled by high winds or falling trees, with 30,000 waiting for supply to be reconnected early Saturday, authorities said. Residents returned to find homes slaked in mud and ankle-deep water, while many southern roads remained blocked by the fallen power lines. “The roofs on some rooms in my house are gone. The house is filled with mud,” Boonchuay Chuaysri told AFP in Talum Puka headland where the eye of storm barged through villages. Others were relieved to find only broken windows as Pabuk’s force was less destructive than first feared. Pabuk struck in peak tourist season, a blow to the cash-cow industry that is integral to Thailand’s economy. The kingdom is expected to welcome a record 40 million visitors this year.